Extend the life of your orthodontic pliers and instruments with Precision Plier Service brand instrument care products. These products were carefully developed with one very specific goal in mind, Prolong Precision Performance™. As The Worlds 1st Orthodontic Plier Repair Company, we’ve serviced more than 1,000,000 orthodontic instruments; no company on the planet understands orthodontic instrument care better than Precision Plier Service. Trust the experts, trust Precision Plier Service brand instrument care products. 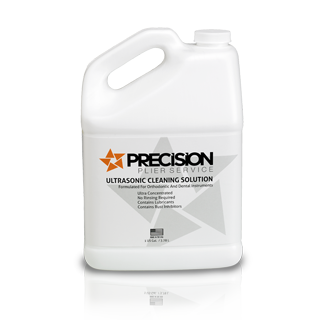 Precision Plier Service brand Ultrasonic Cleaning Solution has been specially formulated for orthodontic and dental instruments. There’s no other ultrasonic solution on the market that can match the high performance properties contained in this premium quality instrument care product. 1 Gallon: $39.98 / Gal. 4 Gallons (1 Case): $36.98 / Gal. 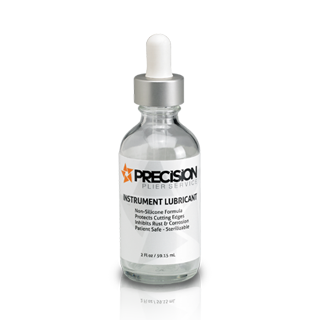 Precision Plier Service brand orthodontic instrument lubricant is an advanced formula developed for hinged orthodontic instruments. This unique lubricant is steam permeable to ensure patient safety through complete sterilization. High performance properties help to inhibit rust, protect precision cutting edges and keep your orthodontic instrument hinges moving freely. Prolong Precision Performance™ with Precision Plier Service brand Instrument Lubricant. 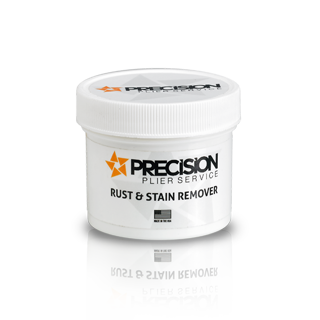 Precision Plier Service brand Stain & Rust Remover paste has been specially formulated for orthodontic pliers and instruments. A high performance, non toxic, three-in-one solution, this paste cleans, polishes, and protects in one simple application. This dynamic, easy to use product was developed for quick removal of surface stains and rust from chrome plated and stainless steel orthodontic pliers and instruments. Prolong Precision Performance™ with Precision Plier Service brand Stain & Rust Remover. © 2017 Copyright Precision Plier Service. All Rights Reserved.